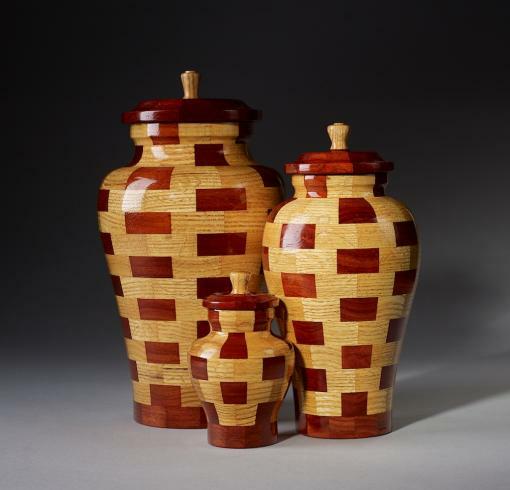 Designed using contrasting Red Oak and Padauk wood pieces, the Serenity wood turned urn is available in keepsake urn, small, and large sizes. After being handcrafted and hand turned by the designer, the Serenity urn is finished with a UV-protectant urethane. 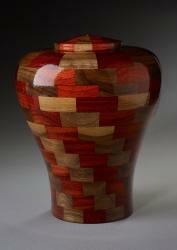 This gives the cremation urn a smooth feel and will protect it from light if the urn is to be displayed. 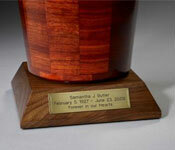 The Serenity urn is a gorgeous piece of craftsmanship and artwork that will be a testament to your loved one. Just wanted to let you know we received the urn exactly as you promised. Thank you for expediting the shipment. It was exactly what we wanted and more importantly exactly what my mother in law requested. It was beautiful.